As this thunderous year of Rockin’ for West Papua comes to an end, our campaign team again marvels at what becomes possible when the individual contributions of so many come together to create one big beautiful collective force for good. No matter how many global actions we do, pairing music with our mission to raise awareness for West Papua takes on a life and palpable energy of its own. Each year is as unique as the generous people who show up to shape the experience. United Liberation Movement for West Papua. Chairman Benny Wenda, and Founder and Organizer of the Rockin’ For West Papua series Ash Brennan, send out their messages of thanks to acknowledge all of the hard work and dedication from all who made this another fantastic year. 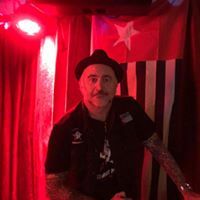 “Last Friday night When Lord Jord took to the stage in Cornwall for the final Rockin’ for West Papua show of 2018 they were the 90th band in 3 weeks to stand against the genocide and human rights abuses happening for the last 60 years in West Papua. If you follow the Rockin’ for West Papua Facebook page, you would have seen live feeds feeds coming in from UK, South Africa, Netherlands and Melbourne. Photos and videos were coming in quickly from across Australia, and around the world, at times it was hard to keep up! What is refreshing to me as the Organiser, is seeing a new wave of quality bands, artists, and venues who are eager to promote the West Papuan cause. FNQ’s Cam Cusack and girlfriend Amber, who have been playing live around Northern Australia all year, with the Morning Star Flag on stage. Going one better for their Ellis Beach gig, they created a huge flag which I know they have special plans for on Dec 1st. Banshees Bar Ipswich owners Ken and Nina came aboard last year, and again put on a killer gig. The old guard from Punks for West Papua flags were represented in Sydney, Gold Coast and Galicia in Spain. Sunshine Coast and Townsville came aboard this year and had successful shows. Jo Volta from Hobart’s, summed it up best “The love that every artist expressed on stage and strength of conviction for freedom for West Papua was the best thing ever.” The response in turn from the crowd was equally wonderful. Here in Australia I believe our biggest problem is apathy. We are the lucky country. If the sun is shining, and beer is cold, who cares what else is happening? Therefore taking the cause into pubs where West Papuan advocates and the average bloke, can come together to rock out as one, creates a perfect way to get our message across. I have spoken in front of crowds many times and it doesn’t bother me, but I must admit, in a room heaving full of Skid Row fans last Sunday at Frankie’s, I approached the mic with a bit of fear that I would be shouted down by this mob. I stumbled over the first couple of lines, but when they started reacting to my words. I didn’t miss a beat. After at least 20 – 30 people wanted to know more and get involved. If we have conviction, and believe in what we are doing, it is amazing what we can accomplish. 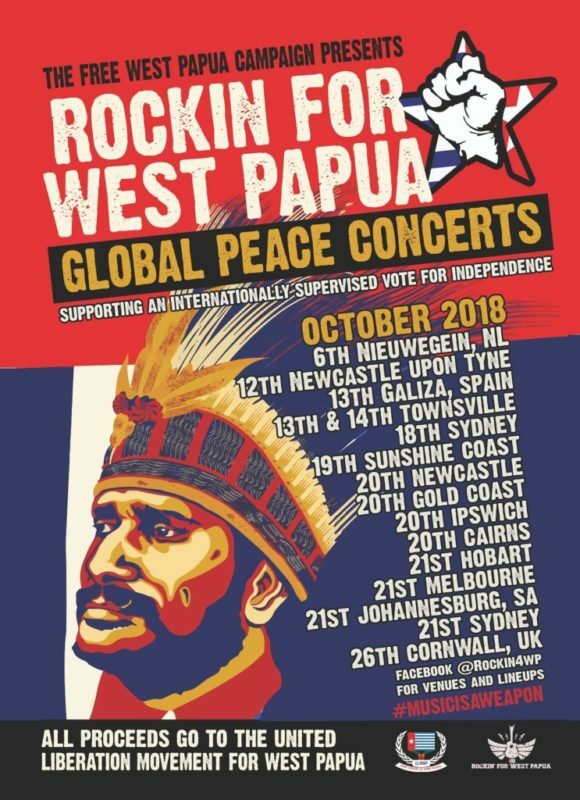 Because of the conviction and belief of every band and organiser that has been apart of this effort, Rockin’ for West Papua gigs has raised funds and awareness to provide real hope for West Papuans on their quest for Independence. So thank you to all those who gave their time this year. The Free West Papua Campaign also extends our sincerest THANK YOU to all of the incredible organizers and musicians in Nederland, Newcastle Upon Tyne UK, Galiza Spain, Townsville Aus, Sydney Aus, Auckland. Aotearoa, Sunshine Coast Aus, Newcastle Aus, Gold Coast Aus, Ipswich Aus, Cairns Aus, Hobart Aus, Melbourne Aus, Johannesburg South Africa, Sydney Aus, and Penzance Cornwall in the UK. From the seasoned professionals to the grassroots independents, the presence of each of you added value to this urgent conversation. Thank you for showing up and putting on really meaningful action for West Papua. Although this series of Rockin’ For West Papua shows are now complete, we have more exciting news to announce very soon. Please stay tuned on our social media pages @freewestpapua and @rockin4wp to get the latest updates being organized for December 1st and all throughout 2019. Thank you all once again. We very much look forward to making more great connections and progress for the people of West Papua.